To assess the linearity of the assay, samples were spiked with high concentrations of human TF in various matrices and diluted with the Sample Diluent to produce samples with values within the dynamic range of the assay. The recovery of human TF spiked to levels throughout the range of the assay in various matrices was evaluated. Samples were diluted prior to assay as directed in the Sample Preparation section. 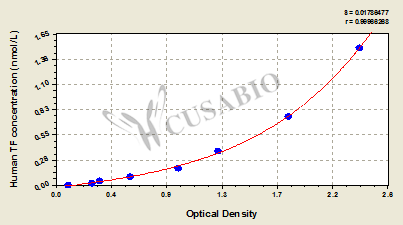 This assay has high sensitivity and excellent specificity for detection of Homo sapiens (Human) TF. No significant cross-reactivity or interference between Homo sapiens (Human) TF and analogues was observed. Create a standard curve by reducing the data using computer software capable of generating a four parameter logistic (4-PL) curve-fit. As an alternative, construct a standard curve by plotting the mean absorbance for each standard on the x-axis against the concentration on the y-axis and draw a best fit curve through the points on the graph. The data may be linearized by plotting the log of the TF concentrations versus the log of the O.D. and the best fit line can be determined by regression analysis. This procedure will produce an adequate but less precise fit of the data.